The Short walking boot offers a solution to indications related to the forefoot, mid-foot and hind foot injuries, as well as some ankle injuries. The Short has a durable, semi-rigid shell that helps support the limb while providing protection. The pre-inflated front panel and two adjustable distal aircells, housed within the shell, provide compression and support. SoftStrike technology absorbs and dissipates shock, while the light weight rocker sole combine to encourage a natural gait and a continuation of everyday activities. Low profile rocker sole. The rocker sole, enables a normal walking gait with less forefoot angulations. Toe-off section continues the rocking motion, enhancing mobility. Mid-stance section is designed to minimize hip differential. Custom and comfortable fit. Trimmable and heat moldable semi-rigid shell makes it easy to custom-fit the brace to the patient. Sleek, open-frame design provides ventilation and patient protection and compliance. Shell contours around the malleoli, eliminating pressure for sustained comfort. AirSelect boots have improved width around the ankle area as well as uniformed sizing throughout the various sizes of the boot (XS-XL). Ease of application. Three-strap system evenly disperses pressure, eliminates pooling of edema. Integrated inflation system is intuitive and permits quick and easy customization of each aircell. Where can I purchase a replacement liner for this boot? I have another 4 weeks to go in mine and with the warm weather, it would be nice to have a back up liner for when I'm washing and air drying the other one. How well does this boot protect the foot after bunionectomy with toe fusion, and hammertoe surgery? 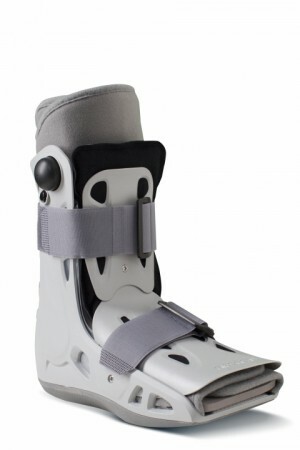 Is walking in this boot considered partial or full weight bearing? Thank you for your question. The AirCast AirSelect Short Walking Boot is designed to be worn after a bunionectomy. It will allow for partial weight bearing for the foot. The AirSelect Short is a re-designed model from the Aircast SP walker. The aircells have been changed for easier inflation and the front panel is pre-inflated. The boot was made lighter than the older model. The AirSelect walking boots have been designed to provide a more natural gait to the patient, and less hip differential, which has been a cause of discomfort for some patients. The bottom of the sole has a improved non-marking skid resistant rubber tread for greater traction and longer wear.